A thermal laminator is a machine that seals your documents, photos, and other items within a layer of film. The reason for doing so is to protect them from water, damage, as well as wear and tear. The laminator market is broad, with many options to suit various fields. In the list below, you will get to learn about regular office laminators, ones that are suitable for home use, and others that are ideal for commercial environments. You are sure to find one that meets the mark for your needs below. 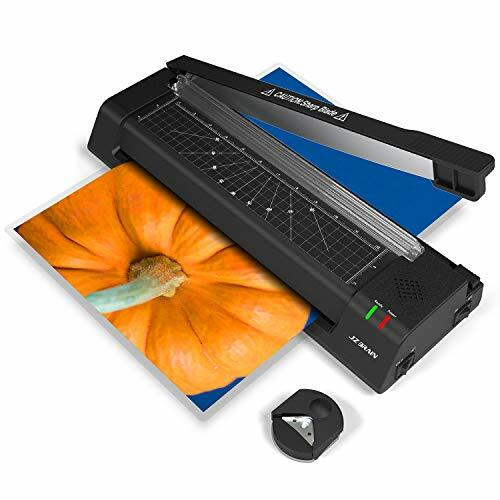 If you’re in the market for a new thermal laminator, but you don’t have a large budget, then check out this unit from AmazonBasics. For the price of a few cups of coffee, you could have a brand new laminator that works quickly and effortlessly to laminate whatever you want. It will handle both 3mm and 5mm regular laminating pockets, and has a nine-inch width capacity. It will also only take a few minutes to heat up – something that not all thermal laminators can do. However, there is so much more to this thermal laminator than meets the eye. Even though it’s far more affordable than others, it can do a lot. You can laminate card stock, regular paper, photos, signs, and almost anything at all. It’s also lightweight to be more portable – meaning you can use it at home or the office. If you find yourself facing a jam, which can happen with thicker items, there is a lever to relieve the problem. Even though it’s noisy to operate and does appear to be flimsy, it still gets the job done – no matter your industry or need. If you are a fan of arts and crafts but don’t have a lot of space at home, then this thermal laminator from Blusmart is going to intrigue. Even though it’s a regular laminator for taking care of signs, photos, and other items, it’s also so much more. It’s a three-in-one machine that can trim paper, perforate it, create waves, and cut corners. It’s the ultimate craft machine for use at home or in a place of business. The four-in-one functionality is the tip of the iceberg, for there are many other features that you will find to be convenient. You can run it in hot or cold mode depending on what you are laminating, and it heats up quickly as well. You won’t be waiting around for long for it to get going. It’s also effortless to use, laminates quickly and has a sleek design in either black or white. You can choose the color that suits you the best. 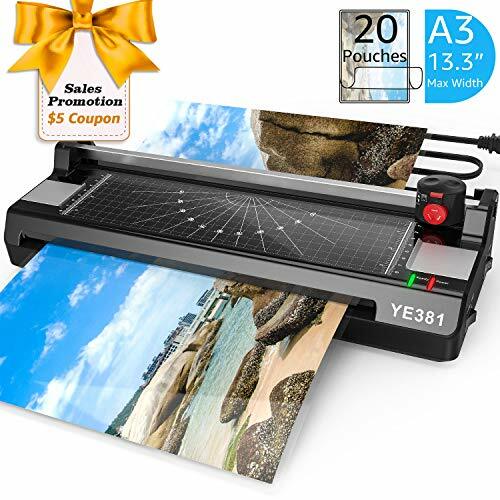 When you buy this thermal laminator, you also get ten laminating pockets to start you off, while benefiting from the knowledge that you can also use self-adhesive pouches in this machine too. While it can have problems with misfeeding, overheating, and incorrect measurements for cutting, for the majority of the time it’s an excellent machine. Buy this thermal laminator, and it won’t disappoint. Trying to find a hardy and reliable thermal laminator is no easy feat, but this Scotch thermal laminator proves that good things come to those who wait. Once you track one down online and purchase it, you will be pleased you did. It’s not the most affordable thermal laminator on the market, but it comes from a reputable manufacturer that will see you have no qualms about spending a little more. It also has two rollers, making it a professional machine that far surpasses your expectations every time. It can take care of laminating projects up to nine inches wide and is even safe for use with photos. What’s more, you can use both 3mm and 5mm pockets with this laminator – but they are quite expensive to buy for this machine. When you start this thermal laminator up, it does take far longer to warm up than others, but it will be worth the wait. It then cranks through the laminating tasks at 11.8 inches per minute, only stopping to jam occasionally – which you can clear quickly with the jam release lever. 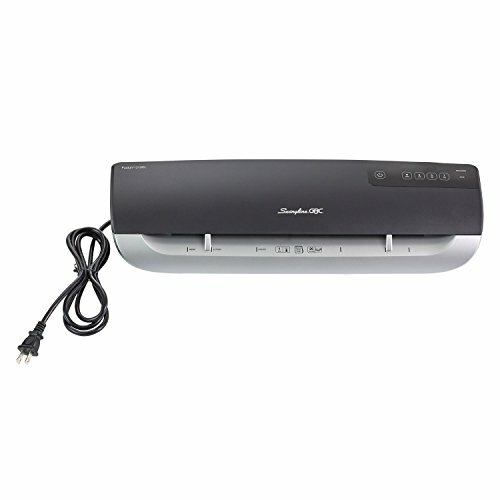 This thermal laminator is lightweight, has guides to minimize mishandling, and is ideal for home or office use. 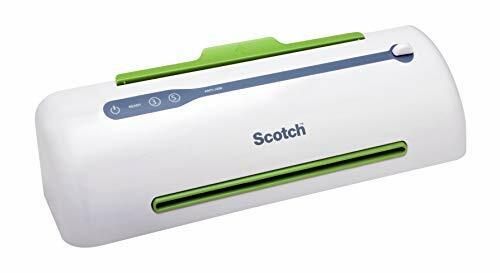 If the time has come to buy a new laminator, don’t look past this one from Scotch. What you’ll find with any thermal laminator you buy, is that they will heat up slowly then run slowly as well. If you are in an office environment, you don’t have time for that. That’s where this thermal laminator from Swingline comes in. Even though it’s far more expensive than most other options on the market, you get what you pay for – a premium laminator that does everything you need it to do in half the time of others. This thermal laminator also laminates pages at least three inches wider than most regular machines and has a lightning fast warm-up time of one minute. Most other units are at least a few, if not five to seven minutes. It will then laminate 31 inches per minute, taking care of pockets between 3mm and 7mm thick. It doesn’t get much better than that. What you will also appreciate is that it can laminate on hot or cold if you have self-seal pouches, and it comes with 30 pockets to get you going as well. Sealing the deal is the electronic jamming and shut-off protection. This laminator is leagues ahead of its competition in the market. Whether you need a thermal laminator for home or office use, you will be more than impressed with what SARKI has to offer. Not only will it take care of regular office documents, but so much more. Unlike other thermal laminators on the market, you can use it with A3, A4, and A6 documents, photos, and other items. It doesn’t get much better than that! This thermal laminator stands out because it uses a two-roller system instead of one. As a result, it’s more than suitable for an office environment. It’s also available in a sleek white color while being quick to warm up in three minutes, and even quicker to run through 10.2 inches of laminating in only one minute. The LED indicator light also proves to be helpful, telling you when it’s ready for use or not. If you find yourself with a pesky jam, you don’t need to worry. This laminator has a jam release switch which quickly releases what you are sealing in a matter of seconds. With four temperature settings to help you laminate with better effectiveness too, it’s clear to see this thermal laminator is well worth a closer look. Even though this thermal laminator can jam far more than other machines on the market, it’s a small price to pay for its speed and efficiency. It doesn’t matter whether you’re laminating documents at home or your office, it will do so quickly and with very few hassles. It can take care of documents up to nine inches wide, and will even cater to all laminate pockets up to 0.02 inches thick. It’s clear to see it has broad compatibility with most people and laminating products. You can also run it on hot or cold modes, depending on your pockets and products of choice. That’s not all this thermal laminator has going for it, either. It’s available in a sleek color to tie in with office furniture, and it has an LED light indicator to let you know when you can use it. Given that it heats in four minutes, you won’t be waiting very long. It clears any jams quickly, runs on 110-220 volts, and comes with a 1.5-year warranty for additional peace of mind. It’s not the best thermal laminator on the market, but it’s not the worst either. Even though you are going to end up spending a lot of money to operate this thermal laminator, you will be pleased you did. As it’s from a reputable supplier, it will offer no end of convenience – whether you use it for laminating at home or the office. It takes only one minute to warm up, and can then take care of any documents up to 12 inches wide. However, you have to make sure you use legitimate Fellowes laminate pockets at 3-5mm thickness otherwise you can run into problems. Other brands of pockets tend to wrinkle and do not perform as well. The unfortunate side effect of this is that the brand pockets are expensive. Pricing aside, there are plenty of other features to have you looking at buying this thermal laminator anyway. It uses InstaHeat technology to seal your documents quickly, and you can also use a hot and cold setting. After use, this laminator will turn itself off, while also offering an easy-to-use jam release lever if you need to use it. 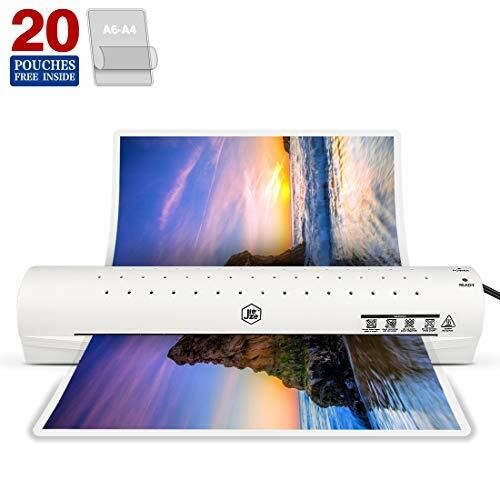 Get started using this thermal laminator right away too, thanks to the inclusion of ten pockets to start you off. There’s no denying this thermal laminator will cost you a lot of money, but the final product will be worth it every time. If you work in a copy center, or you do a lot of laminating on a regular basis, then a standard thermal laminator won’t do. It doesn’t take long to burn them out, and they never operate as quickly or for as long as a heavy-duty one. That’s why you may like to consider the new Apache thermal laminator for all your laminating requirements. It features heavy-duty steel, weighs 21 pounds to keep it in place, and it has four internal silicone rollers for an even better-finished result than standard. Unlike conventional thermal laminators, this machine also has a precise temperature control dial and a forward and reverse switch. This is helpful if you haven’t quite got the angle right when you begin laminating. This thermal laminator will also handle daily, continual use – even though it gets hot quite quickly. It has a professional-grade motor and heating element to pump out more laminated sheets than many other units on the market. If the time has come to purchase a office laminator that can handle daily wear and tear, this one might be worth your consideration. Even though laminating pockets are convenient with a regular thermal laminator, they are less cost-effective and suitable for large-scale jobs. For those, you need this hot laminating machine from BAOSHISHAN. Even though it’s not a well-known brand, there’s every reason to believe this thermal laminator will do you well. 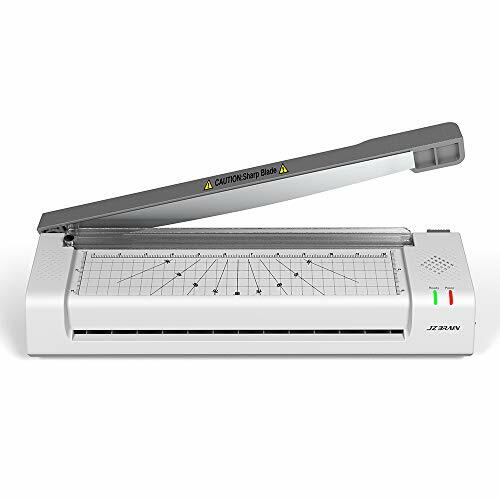 It’s the perfect addition to a busy copy center or an office with regular laminating tasks. Instead of using pockets, this machine uses rolls of a laminate film. Once you install them, which can take some fiddling, you can then seal both or one side – depending on your preference. It will then carry out the task at 1.1 meters per minute – something that regular thermal laminators can’t do. 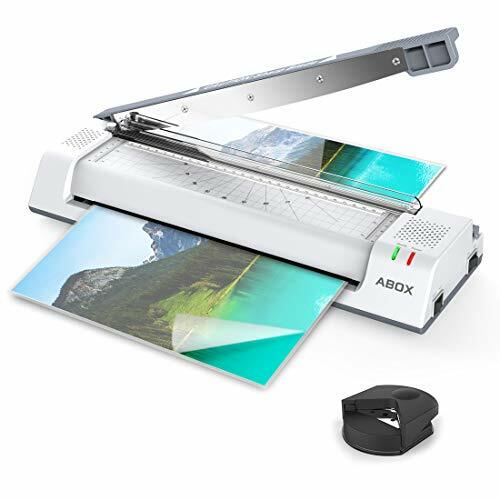 You can also use this laminator with rolls of laminating film between 80-400gsm – perfect for anything from documents to photos and business cards. It also comes with a range of adjustment tools and is a more cost-effective option than regular pockets. You will enjoy using this thermal laminator more than you did your old office one. 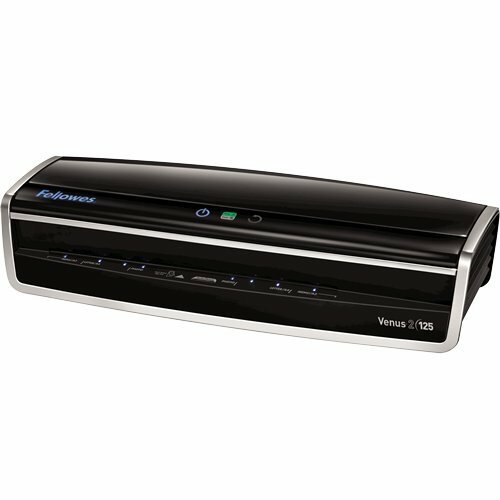 A thermal laminator can be a convenient addition to any office, home, or copy center. However, the variety in the market can see you stumped for knowing which one is going to suit your needs the best. By taking the time to run through your needs and a few features, you can be on your way to choosing the best thermal laminator for your requirements. No thermal laminator is going to run at a hundred miles a minute – they are all relatively slow so that they can do the best job possible. However, some are slower than others. Most can produce around 10 to 12 inches of laminated product per minute, while industrial ones can do as much as one meter in the same time frame. Think about how quickly you need to laminate your items – typically determined by how many things you have to do. The unfortunate reality is that not all laminating pouches on the market are going to be suitable for all laminators. Some manufacturers make sure that their brand of pockets is the only ones that don’t act up. Read the comments and refer to the recommend pockets by the manufacturer. You may find they are more expensive than generic ones – increasing your operating costs over time. What do you intend on laminating? Some thermal laminators are better for some products than others. The most common laminator is the A4 variety, and some cater to A3 and even A6 sizes as well. Read the fine print and pay attention to the measurements. The feed measurement is not the same as the pocket sizing it will take.